Ellinis started life as the handsome vessel ‘Lurline’, built for Matson Lines and introduced in 1932. The Greek operator Chandris Lines bought her in 1963, increased her passenger capacity and operated a regular service between England, Greece and Australia as well as occasional cruises. Her re-build for Chandris was extensive and Ellinis proved to be popular. After a long, successful career and with the migrant trade drying up, Ellinis was relegated to cruising in 1975 before finally being laid up and scrapped by 1987. For those that sailed aboard her, Ellinis still conjures memories of fun days spent at sea. This illustration of 'Ellinis' was completed over the course of two weeks in October 2018 by Michael C Brady and involved around 50 hours of drawing. Original plans and high-definition photographs were studied in order to maintain authenticity. Ellinis’ external appearance was extensively modernised after Chandris bought her; this included the installation of a raked, tall radar tower above the bridge. Ellinis’ stern decks included a children’s play area (with netting to facilitate ball games) and a popular swimming pool. Ellinis’ lifeboats were often used to ferry people ashore during cruises - this could be uncomfortable for passengers as they lacked roofs. 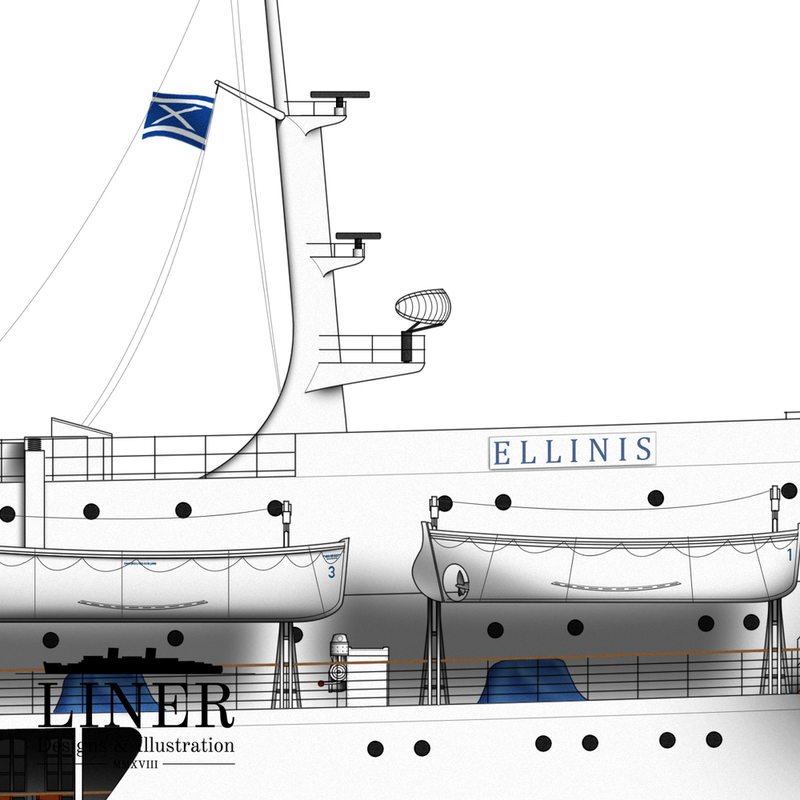 Ellinis’ hull was permeated with shell doors for faster loading of passengers. One can see the deckchairs here lining her promenade; this open-air space was very popular with passengers.